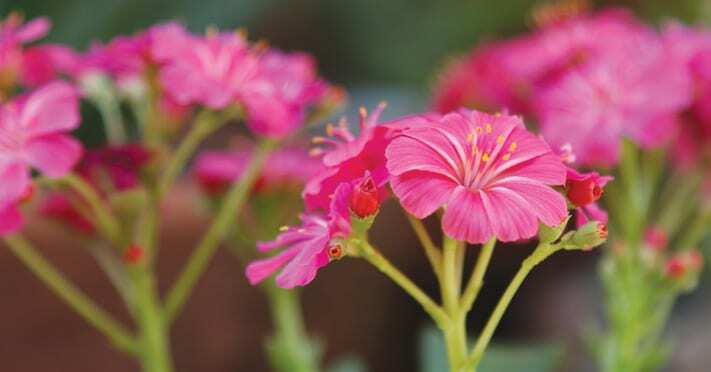 Lewisia cotyledon ‘Elise Mix’ is a strikingly beautiful addition to the range of flowering succulents for low-water gardens and containers, as well as for indoors as a long-lasting decor plant. Originating from the USA’s Pacific Northwest and the Rocky Mountains, it needs well-drained, moderately fertile, gritty soil that provides perfect drainage around the plant’s crown, especially in winter when it can rot from too much moisture. Lewisia ‘Elise Mix’ is a first-year-flowering perennial hybrid that is low-growing, compact (15 – 30cm high and wide) and ideal for rock gardens, in-between pavers and in mixed plantings with other succulents or plants with low water needs. Sprays of brightly coloured flowers in shades of pink to deep magenta, yellow, peach and orange appear from late spring to early winter (or the first frost). They are carried above a rosette of fleshy, spoon-shaped green leaves. 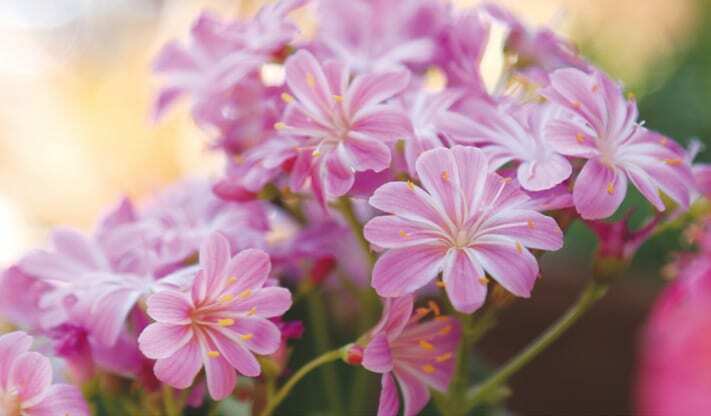 In cooler climates Lewisia does best in full sun, but in warmer areas it prefers partial shade. Indoors it needs bright light or full sun and a warm environment without draughts. Once established it is drought tolerant. It flowers best, though, with regular watering, but allow the soil to dry out before watering again to prevent it from rotting. Fertilise once a month with an all-purpose fertiliser at half strength during its growing season. Protect from aphids, slugs and snails, as well as moisture during winter. It has received the prestigious Award of Garden Merit of the Royal Horticultural Society.